SAN FRANCISCO () -- Earlier this month, Eastmain Resources [TSX:ER] reported visible gold in 19 intersections from holes drilled at the company's 100%-owned flagship Clearwater Project, ranging from 0.5 to 4 metres in thickness. In speaking to RI at the , the company said the grades could be as high as 30 g/t. Cathy Butella, exploration manager of Eastmain Resources, said drill results from the company's 51-hole campaign will be sent to the lab next week with a turnaround time for assays in about 4-6 weeks. She expected resources to potentially double at the 100%-owned Eau Claire deposit with a revised resource estimate due early next year. The Eau Claire deposit is located within the Clearwater Property in the Eastmain River area, James Bay District in Northern Qu'ebec, adjacent to the El'eonore discovery. It currently hosts nearly 1 million gold ounces in resources: 313,191 indicated and 679,464 inferred. 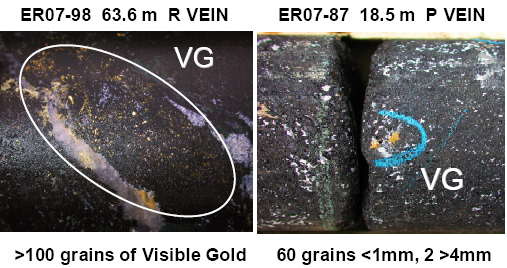 The surface gold grade alone shows 23.5 g/t (0.70 oz/t), calculated to be more than 1000 ounces per vertical metre, but drilling in 2006 extending the vertical depth to 900 metres. The 2007 drilling campaign was designed to upgrade surface resources to the measured and indicated category by evaluating the deposit for a strike-length of 300 metres and to a vertical depth of over 50 metres. Results have so far demonstrated the gold grades appear to increase with closer drill spacing and increased sample size. But deep drilling highlights from the D vein show 1.24 oz/t at 400 metres, 1 oz/t at 600 metres and 1.22 oz/t at 880 metres. High grade veins from 450 West Zone include 0.89 oz/t over a length of 167 metres, 0.53 oz/t for 138 metres and 1.70 oz/t for 58.2 metres. The company will seek permitting for bulk sampling in Q1 2008. Eastmain is also proceeding with a scoping study, which will ultimately entail shipping a 10,000-tonne bulk sample to an operating mill for processing. This study will assess the economic potential and mining parameters at Eau Claire. Hydro Quebec has a power connection within just 3 miles for electricity. The company has submitted an application to the Quebec government for a two-kilometre road to the deposit to facilitate future exploration and development of the property. Butella said there is a possibility that Eastmain could use Goldcorp's [NYSE:GG; TSX:G] Eleonore mill when completed just 200 kilometres away to process the ore, possibly through custom milling for a share of the profits. It would cost roughly $20 per tonne for 100,000 tonnes to truck the ore out. Goldcorp is the company's largest institutional shareholder at 9.5%, with other major shareholders making up about 30%. Butella said Goldcorp has visited the site three times and commented on the similarity it has to the nearby Roberto deposit at the Eleonore mine, which contains nearly 3 million ounces of resources. Eastmain is already in a JV with Goldcorp at Eleonore South, where Goldcorp, Eastmain and Azimut [TSX-V:AZM] all own 33% of the project. This is consistent with Eastmain's strategy of forming partnerships with major companies to minimize exploration risk and help with funding. Eastmain already has partnerships with Barrick [NYSE:ABX; TSX:ABX], Newmont [NYSE:NEM], BHP [NYSE:BHP] and Xstrata [LSE:XTA] at other projects. But in the best case scenario, Butella said the company would prefer a full buyout of Eau Claire as opposed to a JV to focus on its 100%-owned Eastmain Mine. The company's second most advanced project hosts 255,000 ounces in the measured and indicated category. Shares of Eastmain are currently up 3 cents at 69 Canadian cents today on TSX. However, the net asset value of its total measured & indicated resources is equivalent to $184.2 million at $750 gold or $2.69/share. The company has a market cap of about C$55 million on a fully diluted basis with 78.6 million shares outstanding. At the end of Q3, Eastmain has C$5.4 million in cash and no debt.